It’s hard to keep track of the bewildering blizzard of breakthroughs we’re currently seeing in flat-screen technology, with everything from OLED TVs to jumbo plasmas vying for our attention. 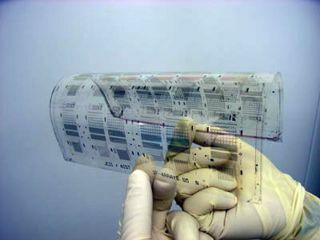 Nevertheless, a breakthrough from Japan's National Institute of Advanced Industrial Science and Technology (AIST) promises cheap and flexible TFT screens that could be suitable for flexible electronic paper that might one day form the roll-up screens of our dreams [Japanese]. Working with the Japan Chemical Innovation Institute (JCII), AIST has succeeded in creating a working 200dpi flexible TFT using a printing technique instead of the traditional electronic circuit approach. The elements of the 6-inch-square are embossed as microscopic patterns onto the plastic substrate in five layers, each as thin as 200nm, making it clear that we’re looking at a paper-like display here. If all goes well with the research, AIST could ready a larger, more capable version within 18 months and a commercial product by 2015.